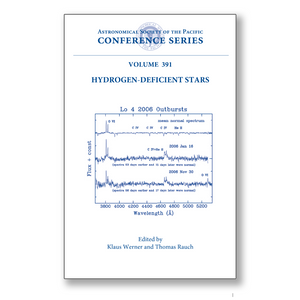 These are the proceedings of a conference on Hydrogen-Deficient Stars held at the University of Tübingen, Germany, from September 17-21 2007. This conference was the third in a series of international colloquia on this topic. The first one took place in Mysore, India in 1985, and the second one a decade alter, 1995 in Bamberg, Germany. Twelve years later it was considered useful to gather again to discuss the progress and the future directions in this field. At the conference 68 participants from 20 countries presented 25 invited talks, 27 contributed talks, and 16 posters. Hydrogen-deficiency is exhibited by many evolved high-and low-mass stars. Therefore research on hydrogen-deficient stars is quite diverse since such stars are found in almost every region of the Hertzsprung-Russell diagram. The stellar classes discussed in detail at the conference were: R Coronae Borealis stars, extreme helium stars, Wolf-Rayet central stars of planetary nebulae, PG 1159 stars and related objects, white dwarfs of spectral type DO, DB, and DQ, and helium-rich subdwarf O and B stars. Also highlighted were hydrogen-deficient stars in close binary systems (AM Cvn and ultracompact low-mass X-ray binaries), massive Wolf-Rayet Stars and their relation to Type I supernovae and Gamma-ray bursts. The different classes of objects discussed in this volume are grouped by spectral and pulsational characteristics, by evolutionary scenarios such as late helium flashes and double-degenerate mergers, and by links among the classes.